After our first tasting at Gundlach Bundschu, we moved on to the Benziger Family Winery in Sonoma. Aside from the wine, this winery is worth visiting for three reasons: 1) they have a beautiful picnic area, 2) for $10 you can take a guided tram tour that drives you through the vineyards, and 3) they have a self guided tour (sort of a Vine Museum if you will) which explains the various stages of growth and everything else you could ever want to know about growing grapes. Benziger is a biodynamic winery... which the guide tried to tell me meant even more organic than "organic." They use insects to control the... insects, and they avoid pesticides and other chemicals which would harm the earth and the environment. 2002 Reserve Cabernet Sauvignon ($49) - this wine was rich, complex and smooth, with soft tannins. 2003 Tribute ($75) - other vintages of this big red wine have won accolades from Robert Parker. This was a soft, smooth wine with a great depth of flavors including berries, coffee and fruit. 2004 Port, Sonoma Mountain ($35) - I believe I was the only one in my group to try the Port. The idea of Port seems to scare some people. I found it to be delicious, fruity and rich, and I scribbled on my tasting sheet "a distant cousin to Manishewitz." However, for the most part, we were a bit disappointed with the reserve wines and in hindsight, we feel that we should have tried the other wines first. That night, we drank a $15 bottle of Benziger Family California Syrah that we picked up in the grocery. It was at least as good as any of the reserve wines we tried... possibly better. Price isn't everything. 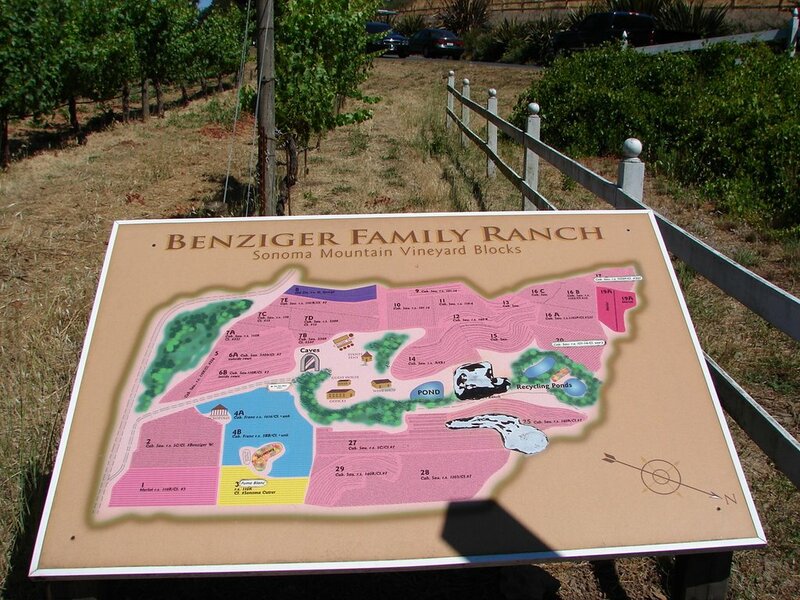 To read a review of a Benziger Family wine that I tried in June 06, click here. 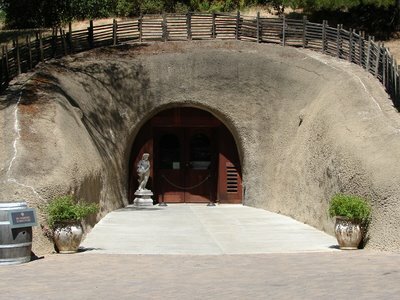 This was my second visit to Gundlach Bundschu (hereinafter "Gun Bun"), and it was my favorite winery on both my trips to Sonoma. There's a great vibe about this place. The tasting room is sort of in a cave... dark and woody, but friendly. Established in 1858, this winery has a long and interesting history, which is worth reading about. It is currently run by a father and son, and they have a woman winemaker who clearly knows her business. I believe the best wine I tasted on this whole trip was their $70 a bottle 2001 Vintage Reserve Cabernet Sauvignon. In the tasting room, $5 will buy you a "flight of four" wines... but our tasting guy told us not to worry about that, and poured us 7 or 8 generous tastes... including multiple tastes of the 2001 Cab mentioned above. Here are the ones that I thought were standouts. 2003 Pinot Noir - Rhinefarm Vineyard ($32). Black cherry, cranberry, clove, tobacco with a beautiful dark ruby hue. We brought a bottle of this home. 2003 Tempranillo - Rhinefarm Vineyard ($30). Smooth, dense, almost smoky, with cherry and dried fig... this one was great! If I had room in the suitcase I would have bought this as well. 2003 Merlot - Rhinefarm Vineyard ($30). We actually drank a bottle of this the night before we visited the winery. A wonderful, rich, smooth and complex merlot. 2003 Zinfandel - MacLeod Vineyard ($24). Fruity and light/bright with a vanilla and oak aroma, this one was not well received by one of my traveling companions (although I liked it). She dared to call it "sweet" and the tasting guy took umbrage and told her the proper term is "fruity." She never did learn to like red Zins, but I enjoy them. 2001 Vintage Reserve Cabernet Sauvignon, Rhinefarm Vineyard. ($70). This was an incredible wine. The aroma was worth $20. It was a big, complex, sophisticated wine with a long, long finish. Fantastic! The best of the whole trip - and there were some good contenders. The tasting guy apparently didn't think we were swirling our wine enough and he did some very exciting demonstrations of swirling, including turning the wineglass on its side (with the wine in it) and rolling it across the counter, and swirling in a most outrageous and violent manner. We thought it was a bit over the top, but when we sniffed the wine, we could absolutely tell the difference. Then he poured some of the 2001 Cab Sav into a decanter and swirled that around for a while before pouring me some to try -- amazingly, it got EVEN better. This was very educational. We really got to taste and smell how exposure to air changed the wine. After that, we swirled like CRAZY for the rest of the trip... and probably will forever. (Of course, there's always the outside chance that this guy was playing a big trick on us, and that at every tasting room we went to afterward people were watching us swirl and saying "oh look, they must have seen Jim over at Gun Bun." But I don't think so). I HIGHLY recommend the Gunlach Bundschu wines. They are harder to find than some, but well worth the effort. 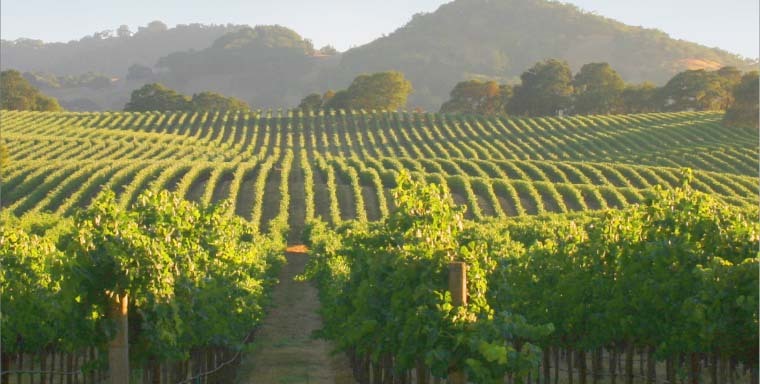 Having just returned from a trip to California's wine country, I can highly recommend it as a vacation destination. This was my second trip - I was there in 2001 as well. Interesting, both times I had the same reaction -- I greatly preferred Sonoma to Napa. To me, Sonoma has a more casual, down to earth, and friendly vibe. Napa, on the other hand, was more expensive, touristy, and upscale for my tastes. 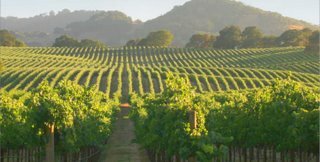 In Sonoma, you could eat at a wonderful restaurant without breaking the bank, and find free or reasonably priced wine tastings. In upcoming postings, I will be reviewing some of the wineries we visited, but for now, I wanted to give some tips for those who may be thinking of visiting this area. Stay in a cottage rather than a hotel. Especially if you are traveling with friends, a cottage makes a lot of sense - you can cook some of your own meals, it's a place to socialize, and it serves as a great "home base." We stayed at Cottage Sonoma, which I recommend highly. More on that in a future posting. Pick up discount coupons. When renting our car, we picked up a flyer in the Hertz office that ended up being invaluable. It had a map, info about wineries, and best of all, many coupons for free tastings, reserve tastings, and discounts on other activities. Get GPS for your rental car. We found the GPS to be a great help navigating from place to place. Most wineries and points of interest were in the GPS and it spared us from wrestling with maps. It even found us a fantastic restaurant in San Francisco which we would never have found otherwise. Start early. Most wineries close at 4:30 or 5 pm, and their hours are limited. So plan accordingly. Don't expect to be able to do more than two or maybe three in a day if you are really going to spend some time in each. Don't drink all your wine. Tastings will often include 5 to 10 different wines... sometimes even more. Although they only pour an ounce or so in your glass, if you try to drink them all you'll end up tipsy and unable to really taste anything. Take a few sips, and pour out the rest. I know that sounds sacreligious, but it's the best way to manage. Save yourself for the wines you really love. Bring crackers. All wineries provide water to help clear your palate between wines, and some even provide breadsticks, but many don't. Bring a package of bland crackers with you and have one between tastings to clean your palate. Ask questions in the tasting rooms. The hospitality people in the winery tasting rooms are often extremely knowlegable about the wines, the grapes, and the whole wine-making process. In some wineries (Rodney Strong for example), the hospitality staff gets special training and ongoing continuing education. It's a great opportunity to learn about wine and wine-making. Take the tour. If you have the opportunity to tour the inner workings of a winery, do so. Some of the tours are guided, some are self-guided, but they are all interesting and educational. Some, like Sterling Vineyards, have extras, like a tram ride up to the winery. 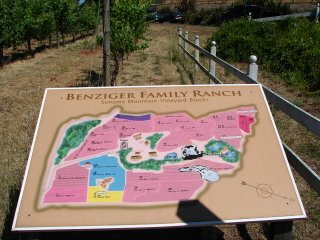 Others, like Benziger Family Winery, have tractor tours through the vineyards. I hope these tips have been helpful. Stay tuned for more Sonoma winery info. Shame on me. In my enthusiasm to create my wine blog and newsletter, I just chose the name I liked (In Vino Veritas), without checking whether other people were using it. It turns out they were. Several blogs share the name, as well as the column by a well known wine critic. And so began the quest for a new name. I tried "bottled poetry" (based on a poem by Robert Louis Stevenson) - taken. "Vinography" - taken. "From the Grape Vine" - taken. 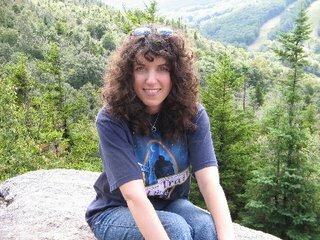 And so, I am opening up this challenge to my readers. Help me find the perfect name for my wine blog and newsletter, and you will win a bottle of wine chosen by me. The rules are simple: The name must be unique. (Try looking up wine blogs or sites on blogger.com and Google as a way of eliminating names that have already been taken.) The name must be appropriate for a blog/newsletter that covers topics including wine and travel, health, tastings, reviews and wine/food combos. Extra points for names that are catchy, clever, and/or memorable. (And keep it clean please.) Entries should be emailed to me by July 21st. The winner will be announced in the newsletter and on the blog, and will win a bottle of wine. Yes, multiple entries are allowed!